What is corruption? (See below a discussion of characteristics of corruption). Corruption is the misuse of public power (by elected politician or appointed civil servant) for private gain. Corruption is the misuse of entrusted power (by heritage, education, marriage, election, appointment or whatever else) for private gain. This broader definition covers not only the politician and the public servant, but also the CEO and CFO of a company, the notary public, the team-leader at a workplace, the administrator or admissions-officer to a private school or hospital, the coach of a soccer-team, etcetera. Corruption is an improbity or decay in the decision-making process in which a decision-maker consents to deviate or demands deviation from the criterion which should rule his or her decision-making, in exchange for a reward or for the promise or expectation of a reward, while these motives influencing his or her decision-making cannot be part of the justification of the decision. Major corruption comes close whenever major events involving large sums of money, multiple ‘players’, or huge quantities of products (think of food and pharmaceuticals) often in disaster situations, are at stake. Preferably, corruption flourishes in situations involving high technology (no one understands the real quality and value of products), or in situations that are chaotic. Think of civil war: who is responsible and who is the rebel? Natural disasters like earthquakes, floods, droughts. The global community reacts quickly but local government might be disorganized and disoriented. Who maintains law and order? Or maybe the purchase of a technologically far advanced aircraft, while only a few can understand the technologies implied in development and production of such a plane. Mostly , the sums of money involved are huge, a relatively small amount of corrupt payment is difficult to attract attention. •whistle blowers and civil society organisations (NGO’s). We know that corruption will not disappear from society. Our efforts are meant to restrict corruption and to protect as much as possible the poor and weak in our societies. In the end all corruption costs are paid by the consumer and the tax-payer. They need protection. 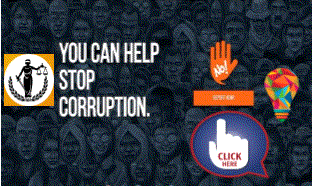 Discussion of corruption is extremely difficult as it is a hidden phenomenon in our societies. Both parties in exchange of power for privileges want to keep their transaction secret. That makes it so difficult to establish how wide and deep corruption penetrated our economy and social life. Moreover, what for some is no more than ‘a friendly turn’ is for others ‘misbehavior’. What in one place can be friendliness is unacceptable elsewhere. Normal behavior at a particular hour of the day may be unacceptable at another hour. Let us have a look into some of the characteristics. Corruption is the abuse of entrusted power and elected authority for private profit. Worldwide complaints are heard about politicians and public officials who accept bribes and enrich themselves privately at the expense of the common citizen. This may be at the expense of the employee and the employer; consumer and producer; renter and tenant; the one applying for a permit to do something, or asking exemption from an obligation to pay or to deliver a product or a service. All those cases may be considered to be abuse of power and authority for one’s own benefit. Complainers forget that necessarily there should also be payers who benefit from that abuse of power and authority. The other side of the coin shows payers assuming that their ‘gift’ to a politician or a public official, may in return deliver profitable preferential treatment or delivery. Please note that repeatedly is stressed the behavior by public officials and politicians. Often the last ones are forgotten. Anyone who wants to fight corruption and safeguard integrity in governance should not only prevent politicians and public officials from unlawfully accepting gifts, but should also fight the ‘high and mighty’ that abuse their power and authority to give privileges such as land rights, permits, diplomas, allowances, money, against a reward. Many among us go one step further. They do not only blame politicians and public officials for willingly accepting bribes. They also often allege that those having authority in our society ask to be bribed or give us the opportunity to bribe. This means that the question ‘who is to blame’, shifts from the person who pays to the person who extorts and receives. Again on the ground of the allegation: ‘There’s no escaping from it, for if you don’t pay, you are bound to fall behind’. Many think that paying bribes is required to ensure smoother operation of society. They think that without an occasional gift (for example, around Christmas and New Year), or incidentally (a gift on the occasion of a marriage or when a child is born) for instance upon entering into a contract for the supply of a product or a service, such contracts might be lost to them and might be assigned to others. For their own enterprises that would then amount to a loss, implying loss of sales potential, which is not what any enterprise or entrepreneur works for. For entrepreneurs who want to secure sales, those gifts are a cost item which they account for in advance in their prices. As a consequence products and services cost unnecessarily more than is needed from a commercial point of view, for as a matter of fact these gifts have already been budgeted. If corruption is judged purely on the basis of business economics, macro-economically it costs money to society which should be considered as a loss. From the micro-economic point of view, for the bribing entrepreneur, it is profitable. The payer of a bribe secures a desired transaction which – if evaluated on purely commercial grounds – strictly speaking, should have been assigned to someone else. That will harm individual entrepreneurs and transactions; it will harm the national economy and the world economy. The mere fact that both the payer and the recipient of bribes want to keep their behavior secret (and often succeed in doing so as well) shows that such behavior is generally considered to be improper. Many consider corruption to be an ethical problem, a behavioral problem. And refer to it as being ‘sinful’, a ‘wrongdoing’. It is a problem to be solved by means of personal ‘reform’. Those who took the initiative to establish Transparency International (TI), the global coalition against corruption, in the last decade of the past century, began calling corruption ‘bad business practices’, which is a moral judgment, not an economical. On the contrary, some in the business community consider corruption to be ‘good business practices’, as they make more money using corruption as a business tool! Poverty in the world is often brought up to account for the phenomenon of corruption. Is that satisfactory? Is it correct and is it proven that the poor are more corrupt than the rich? How come then, that some political leaders are or were so deeply implicated in bribery affairs? They can hardly be said to suffer poverty, can they? Neither can this be said from business leaders, often millionaires, if not billionaires, who are implicated in corruption affairs with political leaders. The explanation that refers to individual poverty reduction is especially given by those who have a keen eye for corruption among lower operational staff in government service, notably lower office clerks, police officers, customs officers, the military, teachers, admission staff in hospitals, bus ticket collectors, car-park attendants, garbage collectors, etc., who on an operational level often have good opportunities to extract extra income or privileges from decisions they might take of importance to entrepreneurs and citizens. Consequently, these have a certain value. The explanation that is given for their sometimes corrupt behavior is that they are poorly paid and that, therefore, they are forced to live on what they can get by way of bribes. Then it fits into the picture painted by this explanation to say that this problem can become even more serious if not only their salaries are low, but, on top of that, they are not paid in time. In the OESO treaty, made for the purpose of fighting corruption, room has been left for citizens and businesses to make so-called ‘facilitating payments’. By that is meant any small payment to a public official for the purpose of somewhat expediting or easing a transaction, that in itself is in accordance with the rules and the law. The example that is always given to illustrate such a case is the transport of fresh vegetables. Is the payment of an insignificant amount of money to the customs officer who can speed up a border check on the perishable cargo in the truck or ship, allowed? He is not doing anything unlawful, he is doing what he has to do, but he does it a bit quicker or earlier. As a result there will be a considerably bigger chance for these vegetables to reach their market fresh. The assumption is that without such ‘facilitating payment’, that truck or that ship may be detained for many more hours or even days, causing the cargo to turn bad, which will result in large financial losses. Gifts are inherent to human relations and therefore present in all cultures. You give and receive gifts on the occasion of birthdays, Santa Claus or Christmas; on the occasion of memorable events; an appointment or a departure; marriage or a retirement. Everybody sees what you give or receive. Such openness is of great importance. In many cultures presenting of gifts is part of the payment traffic. If you make a gift to a village chief in Africa, make it visible to all the villagers who will all benefit from such a gift. When you receive a gift from them, it will also be open and visible to everyone. Corrupt payments are made in hiding, are not made known. A gift made in public will also impose a certain obligation upon the recipient. On a next occasion you will show your gratitude by reciprocating the gift and you share the gift received with your family and friends. In fact, in our everyday life it is not much different. You give and receive on birthdays, on the occasion of marriages and births, and on other festive occasions. Look at the reciprocal state visits of Heads of government and Heads of state, exchanging gifts. Bribes are also gifts, but they are made in secret. High-ranking politicians and public officials in many countries accumulate big fortunes thanks to bribes received. It is essential, whether you just want to be ‘thoughtful’, or whether your gift is presented with a certain intention. Is it a sign of thoughtfulness or is it hiding a particular purpose, an expected ‘return’ in the future? Whether ‘attention’ or ‘intention’, the difference is of great importance for the relationship. Is it a ‘friendly turn’ or is it an ‘investment’? To have friends belongs to culture. However, can you ‘buy’ a friend? Is real friendship not to be based on honesty and transparency? To give presents reciprocally is a sign of friendship. It should not get lost in a misuse of power for private gains.